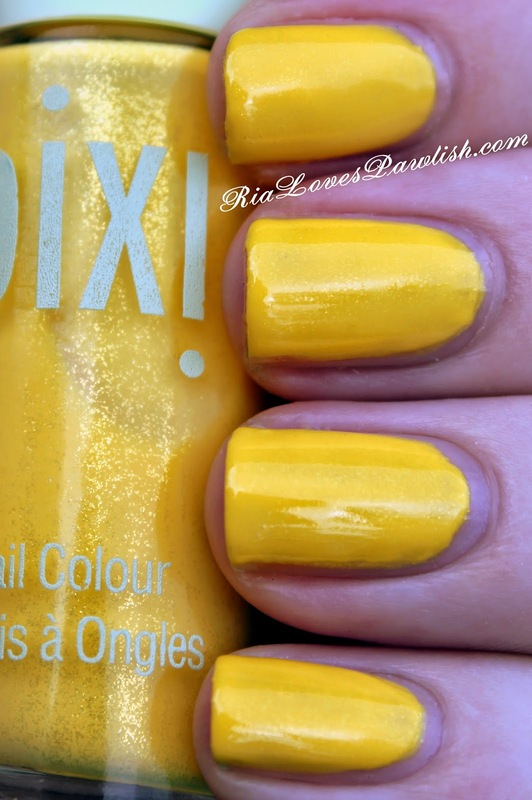 today i have Pixi Sizzling Sunshine to share with you all! (kindly provided to me for review!) it's part of their new release colors, i have two more to share in the next couple posts :) Sizzling Sunshine is a happy yellow with a super subtle shimmer. it mostly stays hidden except when the light hits it just right... but it does lend depth to the color! the formula is a little tricky, i tried two thick coats and got lots of bubbles, three thin coats worked much better. i topped it with topcoat to bring out all the this polish has to offer! three coats Sizzling Sunshine, one coat Sally Hansen Diamond Flash Top Coat. these polishes retail for $8. you can find Pixi products at Target stores, www.Target.com, and www.PixiBeauty.com! !